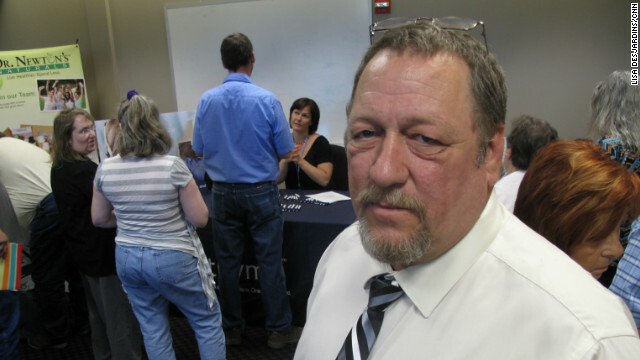 Mike Thomas, 52, at a Lewiston, Maine job fair, a regular stop in two years of looking for work. Lewiston, Maine (CNN) – President Obama and Mitt Romney can point fingers at each other over outsourcing all they want, but in Lewiston, Maine people told us the candidates neither understand the problem with jobs nor how to solve it. Lewiston, nicknamed “the industrial heart of Maine," is a near perfect sample of what’s happening across the country – a place that is both creating some jobs and suffering because it has too far few of them. It is a town of old brick industrial mills. Some closed, some becoming condos. But none leading to many jobs. There are a dozen issues Embed America is covering first hand this month, crisscrossing the highways of America. None of them gets more time at the political podium than jobs. People here in Lewiston pride themselves on being industrious, but many are like Mike Thomas, knocking on every door they can find and getting no offers. For years. There are some people you meet who you don’t ever forget and Mike Thomas, a construction worker who has been looking for a job for two years now, is one of them. He is a big bear of a man who talks about throwing yourself aggressively at any struggle, but who also tears up thinking of the limited food he, his wife and stepson live off now. At the same time, Lewiston is the site of an incredibly good jobs story, one that many hope will set the stage for national change. Boston-based Carbonite, a computer services company, has closed its outsourced call center in India and moved more than 150 jobs stateside, to Lewiston. You can check out all our Embed America coverage here. Congress cannot create jobs. All they can do is get out of the way. Theres no such thing as a jobs bill. What do you want, government jobs building roads that people dont need, using money we dont have? Contrary to what politicians would have you believe, the boom is the problem, the recession is the cure. We make our problems worse by not allowing market forces to balance themselves. Bankrupting ourselves while despreately trying to maintain our bubble economy will end in default or hyperinflation. Read Henry Hazlit, or Milton Friedman, or Thomas Woods, or Ludwig Von Mises. Government make work is fail sauce. Especially read Murray Rothbards The Great Depression. The Obama campaign has to do a better job of getting its message out. These folks who were interviewed in Maine do not know how to brief the two candidate's positions, lay them out side by side, and compare them. The candidates know exactly what they want to do and why. One of them is terribly wrong. These folks need to know that. candidates don't seem to realize or want to admit that across the United States, COLLEGE DEGREED, SKILLED U.S. citizens are being forced to TRAIN entry level from India, and then the U.S. citizen is layed off. CONGRESS IS APPROVING WORK VISAS TO DISPLACE U.S. CITIZENS IN THEIR JOBS! The media is looking the other way, so they don't tick off their advertisers! •H-1b: Congress has authorized employers to sponsor and hire foreign workers regardless of whether qualified Americans are available to fill the positions. Employers can legally force Americans to train their foreign H-1b replacements as a condition of receiving a severance package. •L-1: Congress has authorized employers to bring foreign workers into the U.S. for one year while continuing to pay them their foreign wage level. •PERM: Congress has authorized employers to sponsor foreign workers for green cards by simply running a few classified ads and then to find any reason possible to disqualify all American applicants. cbr – I think it's fair to say people like Mike in the story feel left behind, and certainly not "put first" even with all the jobs talking points in speeches. The candidates might not know what it feels like to be unemployed or underemployed. However, the people around them should know and should be looking at this problem. Obviously, Congress is not concerned because they will not put together a jobs bill or even try to work with the President to write one. Instead they are having their vote to repeal Obamacare. Our representatives do not know how to work with the ideas in the bill. Keep what is good and change what is not. Those opposed do not have a bill ready to go so there will bwe another area that will have people very concerned. What is happening to the ideal that the citizens needs come first.